Sunday (5th November) was a lovely crisp day and formed the perfect backdrop for the Strictly Mulled Wine competition, which took place on Keswick’s Market Square. It was a fun competition between local hotels, cafes and guest houses, with donations made to our charity of the year, Blood Bikes Cumbria. Members of the public were invited to try 10 different mulled wines and then vote for their favourite. This year, there were entries from West View Guest House, Kat’s Kitchen, Café Hope, YHA Keswick, Lyzzick Hall Hotel, The Kings Arms, The Skiddaw Hotel, The Inn on the Square, The Borrowdale Hotel and The Lodore Falls Hotel. Last year, we hosted the event for our hotels to help decide on the best recipe of mulled wine to sell in our bars, this year the prize up for grabs was the Strictly Mulled Wine Cup, supported by both Lake District Hotels and Keswick Town Council. When casting their votes, people were able to enter a competition for an afternoon tea for two at one of our Lake District Hotels and to make a donation to Blood Bikes Cumbria. The winner of the afternoon tea was Pam McNaughton from Penrith whilst Blood Bikes raised £265. 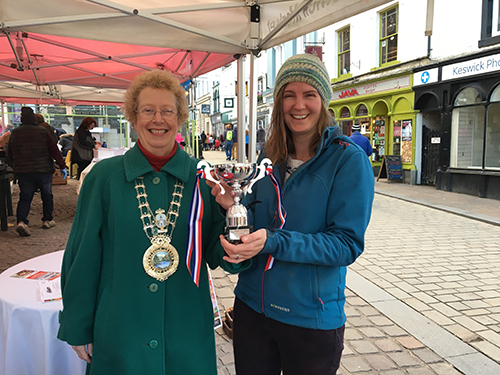 The winner of the cup was announced by Mayor Susan Leighton who had enjoyed testing the wines earlier in the day. In third place was Kat’s Kitchen, second place Lyzzick Hall Hotel and in first place West View Guest House.